According to a new study in Nature, the Milky Way lies at the far end of a filament of stars connected to a huge concentration of galaxies called Laniakea that’s 520 million light-years across and contains 100 quadrillion suns. 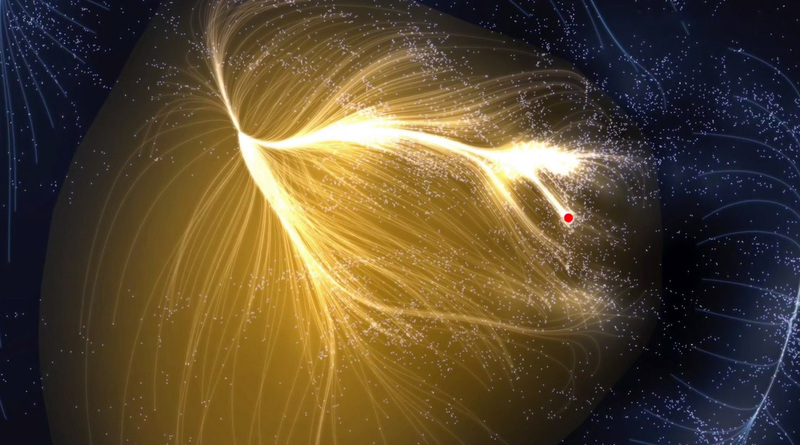 The red dot in the above simulated picture of Laniakea represents the Milky Way’s position. We live on a planet that orbits a sun that orbits a black hole at the center of a galaxy that’s part of a local group of galaxies, that’s part of a galactic cluster, that’s part of the Virgo Supercluster, which consists of about three thousand galaxies. Virgo’s the bright area to the immediate above-left of the red dot. The hair-like strands in the picture depict rivers of galaxies made up of untold gazillions of stars streaming toward Laniakea’s center. The whole cosmic structure links up to the Cosmic Web of galaxies and Dark Matter that spreads out across the entire observable Universe. Let’s get back to Virgo. It’s been known since the 1980s that Virgo’s being inexorably drawn toward a region of galaxy clusters 160 million light-years away known as “The Great Attractor”. Recently, we’ve learned that Virgo is simultaneously being pushed away from a newly-discovered vast empty region of space called the “Dipole Repeller”. The so-called Dipole Repeller doesn’t actually repel. Because a void in space has very little gravitational pull, other gravitational influences become stronger. In this case, absence of pull translates to a powerful push. But there’s more. New data indicate the Great Attractor itself is being drawn toward an even larger collection of galaxy clusters 600 million light-years beyond it called the Shapley Concentration, the most massive known structure in the local Universe. And it’s dragging us right along with it. The whole Laniakea/Great Attractor/Shapley megastructure flows at many speeds, depending on location, gravity pools and eddies, Dark Matter distribution, and the overall expansion rate of the Universe. As one point of reference, our Milky Way galaxy’s zooming through space at over a million miles per hour.